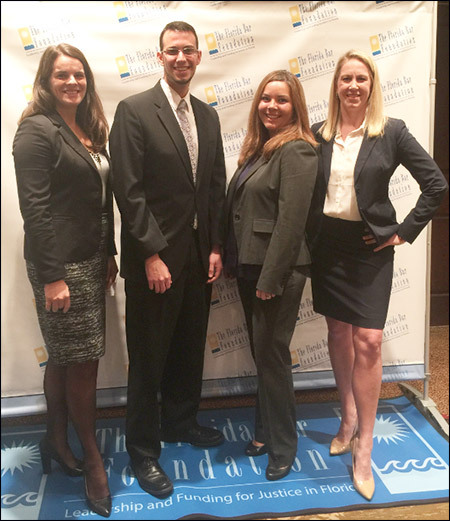 Associate attorneys Matthew Shapiro (second from left) and Kayla Hathaway (right) pictured with Sarah Metz (left), attorney at Smith, Bigman, Brock in Daytona Beach and Katherine Hurst-Miller (second from right), President-Elect of the Florida Bar Young Lawyers Division and partner at Cobb Cole in Daytona Beach attended the Florida Bar Young Lawyers Division Affiliate Outreach Conference held at the Casa Monica hotel in St. Augustine, January 15-16, 2016. Mr. Shapiro is President-Elect for the Volusia County Bar Association Young Lawyers Division and Ms. Hathaway is a board member. They attended the conference as representatives from the organization and presented a grant proposal to obtain funds to create an educational video about the importance of judicial elections. Abandonment of the Marital Home- is such a recognized theory in a divorce case in Florida?